A regular polytope is a geometric figure with a high degree of symmetry. Examples in two dimensions include the square, the regular pentagon and hexagon, and so on. 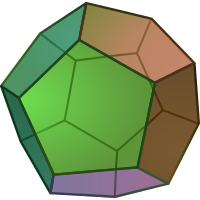 In three dimensions the regular polytopes include the cube, the dodecahedron, and all other Platonic solids. Other Platonic solids include the tetrahedron, the octahedron, the icosahedron. Examples exist in higher dimensions also, such as the 5-dimensional hendecatope. Circles and spheres, although highly symmetric, are not considered polytopes because they do not have flat faces. The strong symmetry of the regular polytopes gives them an aesthetic quality that interests both non-mathematicians and mathematicians. Many regular polytopes, at least in two and three dimensions, exist in nature and have been known since prehistory. The earliest surviving mathematical treatment of these objects comes to us from ancient Greek mathematicians such as Euclid. Indeed, Euclid wrote a systematic study of mathematics, publishing it under the title Elements, which built up a logical theory of geometry and number theory. His work concluded with mathematical descriptions of the five Platonic solids. A Klein bottle is an example of a closed surface (a two-dimensional manifold) that is non-orientable (no distinction between the "inside" and "outside"). This image is a representation of the object in everyday three-dimensional space, but a true Klein bottle is an object in four-dimensional space. When it is constructed in three-dimensions, the "inner neck" of the bottle curves outward and intersects the side; in four dimensions, there is no such self-intersection (the effect is similar to a two-dimensional representation of a cube, in which the edges seem to intersect each other between the corners, whereas no such intersection occurs in a true three-dimensional cube). Also, while any real, physical object would have a thickness to it, the surface of a true Klein bottle has no thickness. Thus in three dimensions there is an inside and outside in a colloquial sense: liquid forced through the opening on the right side of the object would collect at the bottom and be contained on the inside of the object. However, on the four-dimensional object there is no inside and outside in the way that a sphere has an inside and outside: an unbroken curve can be drawn from a point on the "outer" surface (say, the object's lowest point) to the right, past the "lip" to the "inside" of the narrow "neck", around to the "inner" surface of the "body" of the bottle, then around on the "outer" surface of the narrow "neck", up past the "seam" separating the inside and outside (which, as mentioned before, does not exist on the true 4-D object), then around on the "outer" surface of the body back to the starting point (see the light gray curve on this simplified diagram). In this regard, the Klein bottle is a higher-dimensional analog of the Möbius strip, a two-dimensional manifold that is non-orientable in ordinary 3-dimensional space. In fact, a Klein bottle can be constructed (conceptually) by "gluing" the edges of two Möbius strips together.